I know I am a little late, but I just wanted to give a few quick posts about what we’ve been up to lately. During our Veteran’s Day weekend we camped at Styx River. Will was able to take that Sunday off and we had a nice time spending it together. Usually when we camp, Will has to leave on Saturday evening to prepare for church on Sunday and then he doesn’t get back until Monday and we have to start packing up to go home (meaning that we only get one night and two half days with him as a family). So, it was nice to get to spend the entire weekend with Will. My brother Will and his family rented a cabin that weekend and we were able to spend some time with them as well. The kids had a blast playing with Riley. They normally only get to see her for a few hours at a time when we visit Mama’s house. She is growing so fast and is now at that stage where she wants to chase them around and be right in the middle of things. It was pure chaos! 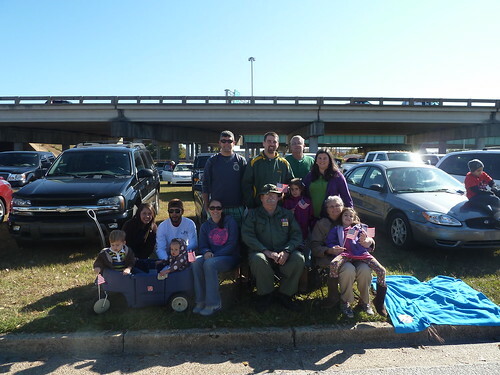 That Friday we met Uncle Charlie, Mama, Daddy, and some family friends at the parade in Mobile. I wanted the kids to get a sense of Veteran’s Day and why we celebrate it. If we don’t take the time to teach our kids how important it is and what a sacrifice the Veteran’s make for us, then the kids just think that they are getting another day off of school. Thanks again to all of the Veteran’s for all that they have sacrificed (time with their families being the greatest of all) for our freedoms. Here is a photo that we took with Uncle Charlie at the parade.